2019 Harley-Davidson® Softail® Softail Slim® THE CLASSIC BOBBER HAS BEEN REBORN A stripped-down, souped-up, bobber with a post WWII era look. You get the power and soul-satisfying sound of the Milwaukee-Eight® 107 V-Twin to take you into the future. Fast. 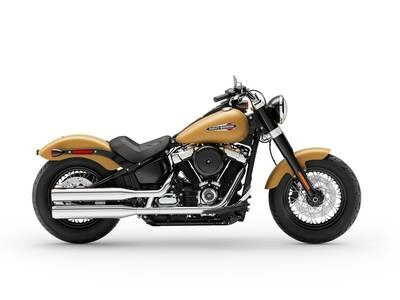 Features may include: TRADITION HAS NEVER RUN STRONGER VINTAGE H-D STYLE The classic look of spoked wheels, chopped fenders and Hollywood handlebars, with a blend of dark and polished finishes. LOW-SLUNG TUCK-AND-ROLL SEAT A low-slung solo saddle that matches the bike’s clean, back-to-basics attitude, setting you “in” the bike so you ride like you’re part of it and the open road ahead. MILWAUKEE-EIGHT® 107 ENGINE A powerful, smooth-running V-Twin engine with crisp throttle response and a pure, soul-satisfying rumble. SOFTAIL® FRAME The reinvented frame retains the classic Softail®lines, but its lightweight design and stiffness translate to a responsive ride unlike anything you've felt before. SIGNATURE LED FORWARD LIGHTING Darkness-defying lighting that give you great visibility at night. HIGH PERFORMANCE FRONT SUSPENSION Sophisticated suspension technology provides the performance of a racing-style cartridge fork for reduced weight with linear damping characteristics. HIGH PERFORMANCE REAR MONO SHOCK Easily adjustable mono-shock rear suspension allows for dynamic cornering while preserving the hardtail look.